John Gonzalez and Amy Sherman of MLive host the podcast and radio show Behind the Mitten. On this weekend's show they broadcast from Hopcat in East Lansing where they talk with some friends, including Paul Starr of I'm a Beer Hound. They also catch up on what's happening at New Holland Brewery and its expansion into Grand Rapids. John and Amy talk to Paul Starr, and they also run into Ryan Engemann of Brewery Vivant, who happened to be at Hopcat. They ... Maggiori informazioni talk about some cool events, including "explorer" classes at the Public Museum of Grand Rapids. Classes will be held June 21, July 19 and Aug. 16. They're titled "Science of Beer," ''Science of Flavor" and "Yeast Science/Wild Fermentations," respectively. Each class includes general admission to the museum — as well as three beer samples. John and Amy catch up with Joel Peterson of New Holland Brewery, as well as Chef Dale Beaubien, who talk about the expansion in Grand Rapids later this fall. John and Amy catch up with New Holland's Pub on 8th Street Head Pub Brewer, Steve “Bert” Berthel, who is passionate about supporting Michigan agriculture as it pertains to the brewing industry. Right now he brews his beers with 100 percent Michigan products. He announces on the show that starting at the Summer Beer Festival in Ypsilanti that New Holland will feature Pub on 8th's beers, which are only available exclusively in Holland. 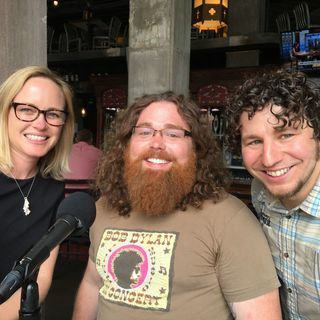 John and Amy get back with Paul Starr of I'm a Beer Hound and Ryan Engemann of Brewery Vivant to talk about some beers on tap at Hopcat East Lansing. They also talk about Lansing Beer Fest, which is June 18 (1-6 p.m. at REO Town). They also feature BEER OF THE WEEK.